As we stare down the move to Lightning Experience across all Salesforce orgs (take it from a mama, time flies), our user base is going to have the biggest adjustment. Hold their hands, tell them it is for the best to migrate, and keep ‘the switch’ quiet! 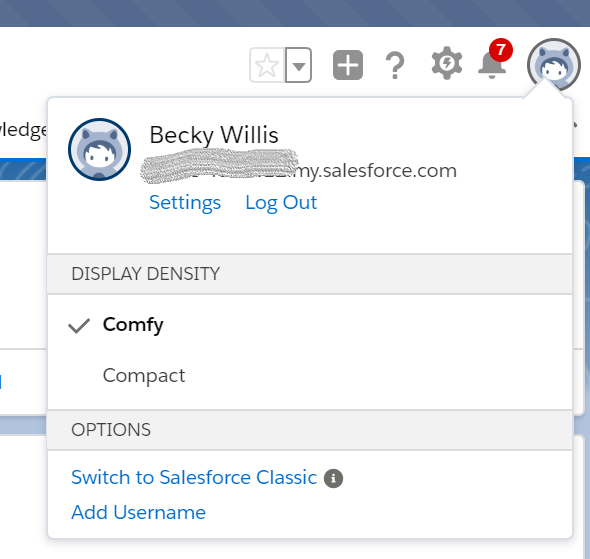 You know the link in the top right of your Salesforce screens…’the switch’ to Classic! While I was brought up on Classic and supported orgs that were so stuck in their goo that migration wasn’t possible, I’m here to tell you to resist the urge and keep it under wraps from your users! Of course, there is a story to prompt this, so let’s dive in. While onsite at my current client (aka the company that bought my previous company) I sat beside a demo to one of my (ex) sales managers. The demo was happening in Classic but we were an hour from wrapping two days of UAT in Lightning! Eek! Of course, the manager, a super savvy Salesforce kool-aid drinker, asks the question, “how do I get that view?!?”. The other consultant and I met eyes and although this was our first time to meet in person responded in unison, “you don’t, this didn’t happen“! He laughed and understood, promised not to share the secret you still can switch (because he’s at sales kickoff this week teaching “old dogs new tricks” in the brand spanking new LEX org), and the demo resumed in Lightning. As a kid, I had a bad experience with lightning. We were camping and a storm hit while I was out riding my bike. Being a wise 12-year-old, I “ran” to the nearest laundry shelter and waited it out. But that lightning had another idea and it struck right down the middle of the shelter, inches away from me. It was that hair raising, skin crawling feeling of I just survived something that could have done me in. Since then, I’m a little leery when storms come up. But being introduced to the Ohana, that fear of Lightning has got to go! After seven years of admin’ing Classic, I’m serious about migrations and implementations in Lightning and I’m here to tell you why to keep that ‘switch’ under wraps! 2. Components are cool. I spent way too much time in my first years as a Salesforce admin exporting data to Excel just to make a pretty graph for management. The Analytics capabilities that you get in LEX are just one of many cool components that are only available in Lightning, so take advantage of the pretty/slick UI and use components as a case for adoption. 3. DIY isn’t going away. If this busy mama has time to spend hours a week watching HGTV and browse Pinterest, that tells you that the cultural trend to do it yourself (DIY) is alive and kicking and it is not going anywhere. And it isn’t limited to our gardens, kitchens, and pressure cookers. The fact that your users can help themselves without the administrative red tape to get support should be a huge selling point. No more configuring layouts for 10 different opinions across 4 different global regions. No more setting this bar to blue and that one to green. Just do some Trailhead lunch and learns and show them the way! 4. Cool tricks. You can’t do this in Classic, just saying. ← NaHaiWriMo Salesforce Haiku Contest! The increase in the data storage is a big plus.